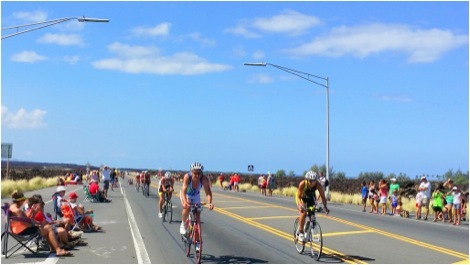 Ironman Passes Through Waikoloa Village | Koa Realty, Inc - Search Big Island Hawaii Properties for sale. Posted October 14, 2014 by Lesley Tanaka & filed under Ironman, Kona Lifestyle, South Kohala, Waikoloa. South Kohala residents and resort guests lined Queen Kaahumanu highway last Saturday to cheer on Ironman triathletes on the second leg of the event — a bike race from Kona to Hawi and back, 112 miles. This, after completing the 2.4 mile swim in Kailua Bay and then followed by a hot 26.2 marathon all to be completed by midnight, qualifies as an official finish. Queen K being closed to through traffic, many fans drove down Waikoloa Road from the upper Mamalahoa highway to access the course. I arrived shortly after 10:30 am, just in time to see two memorable events. The headwinds were challeging, some said 20-25 mph, turning our flat stretch of highway into a grueling workout. We stood near a group of Billy Kenoi fans, there to supprt the 46-year-old mayor of Hawaii Island in his quest to be the first Big Island mayor to finish in the island’s most iconic athletic event. As racers worked by us, we cheered and shouted words of encouragement. Then a shout went up as Billy pulled into sight, and we all broke into applause. Crossing to the makai side of the highway, we waited and then watched amazed as the leader (and triathalon winner) Sebastian Kienle blasted past on his way back to Kona. It seemed like he had a full five minute lead over the next racers! He did — finishing in 8 hours 14 minutes 8 seconds,winning the Ironman World Championship, five minutes ahead of his closest competitor. Later, as the clock ticked toward midnight, Billy Kenoi crossed the finish line with minutes to spare: 16 hours 54 minutes 13 seconds to become an Ironman! It seems Billy was among more than 60 finishers during that final hour, each greeted by roars from a jubilant crowd. Newest Website to Search Big Island Real Estate is FINALLY HERE!